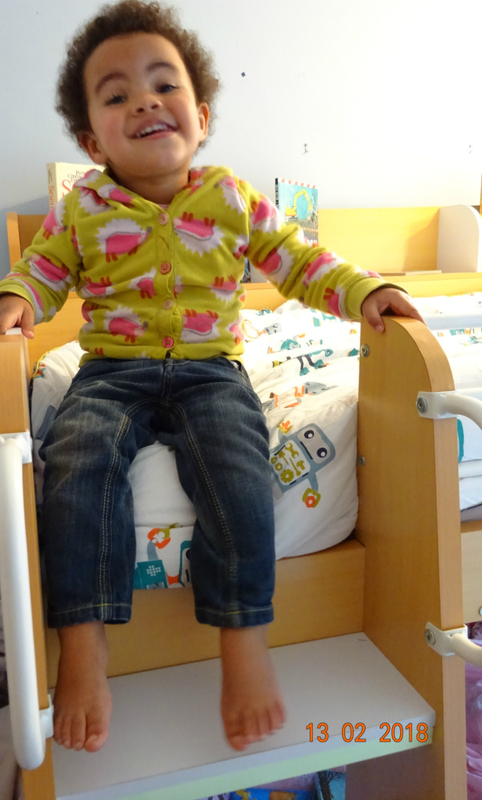 We bought Aaron's Domino bunk bed a few years ago, from Bed Kingdom. I spent weeks looking at all different options and reading all of the reviews. I did look at the Ikea ones that most people go for but as big an Ikea fan as I was and am, the bunk beds didn't at all tick the boxes of what I was looking for. This bunk bed I kept coming back to as I just loved it. Aaron didn't have a sibling at the time and neither was I pregnant. The plan was he'd be on the top bunk and a best mate or cousin would be on the bottom. Both of those scenarios have happened several times since, but there's only one person with her eye on that bottom bunk now and it's my girl. 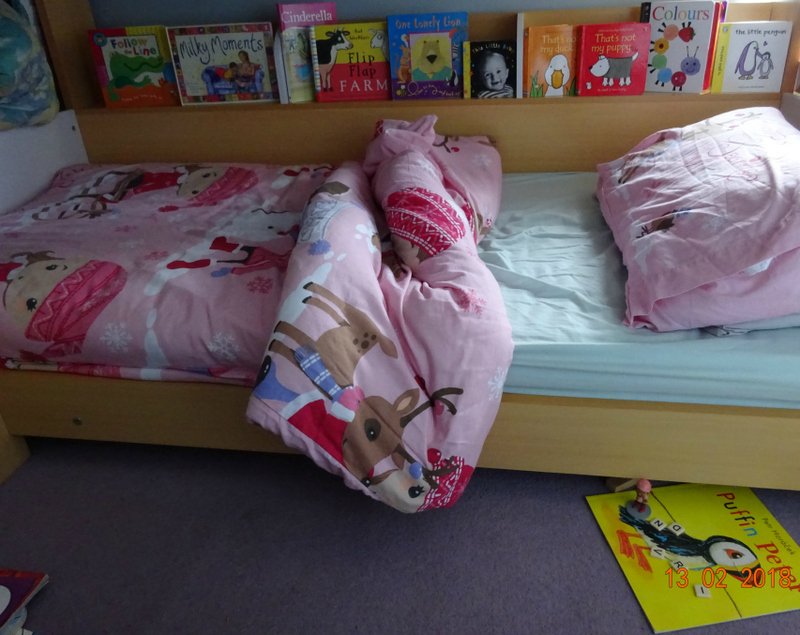 I made it up in pink bed linen at Christmas, as I know she is inclined to hop in there despite being yet to spend a night in there (we're still co-sleeping and breastfeeding currently - quite apt then that we have the book Milky Moments on the shelf below. I bought it off a blogger "Author" friend years ago). 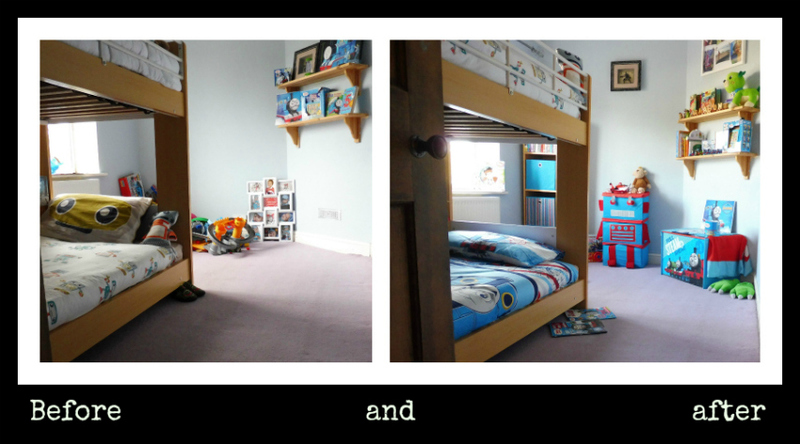 Lottie and I spent the afternoon in Aaron's room today, whilst he was at holiday club in his school, practicing football, Nerf wars, fencing, archery and gymnastics. We went in to give it a much needed sort out, not that Lottie really let me. 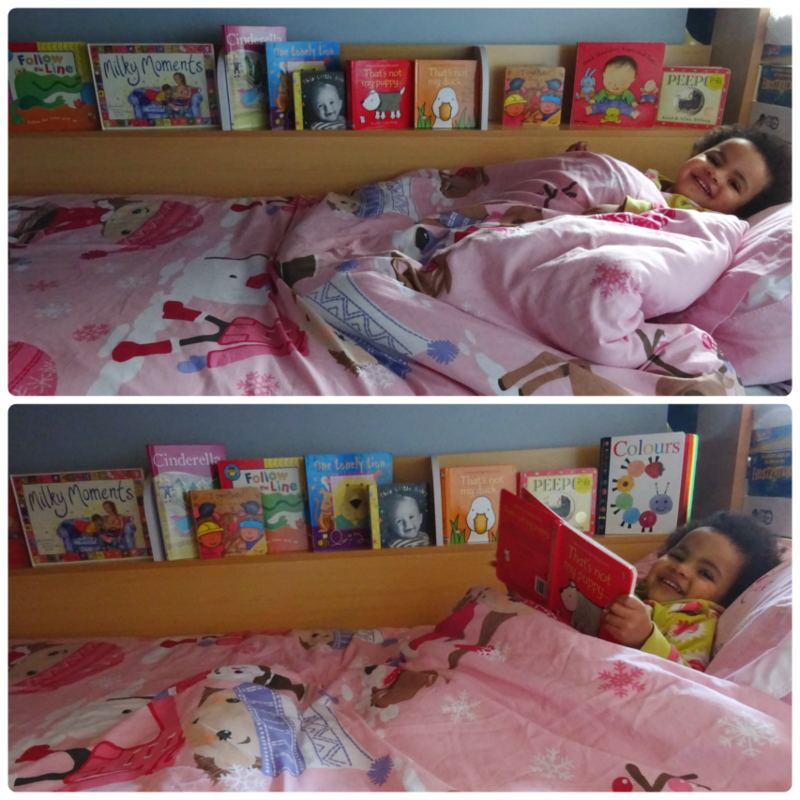 She's showing signs of being a keen bookworm which this particular bunk bed is ideal for given it has a bookshelf attached as part of the build, top and bottom. I detest those book tidies that you have to wall mount for bunk beds. I prefer as with all of my furniture to have a one-stop shop so little surprise my wardrobe has shelves and drawers within it as well as rails minimising the need for a separate chest of drawers and my dining room now has a Kallax adjacent to it perfect for holding a multitude of items including toys! Why have 2 pieces of furniture or more, where one will do! Back to the books, she was so keen to "read" them all she'd move from 1 to the other so quick I spent most of my time putting them all back on the shelves so the keen eyed amongst you will have already noticed the different book arrangement from top to bottom pic above. The beauty of this bunk bed is how very close to the floor the bottom bunk is. I've tried to illustrate that in the picture above. Perfect for a 1st bed. 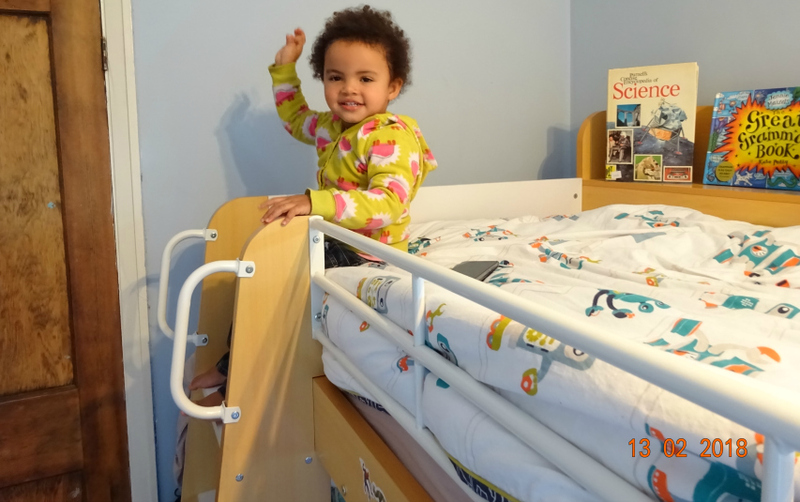 You could nearly do away with a bed guard so small would be the fall, or at least know that whatever climbing they did getting out of bed it would be easy to navigate however sleepy. I can imagine Lottie in there straight from the cot. I just need to get a stair gate for the top of the stairs or for the door frame of the bedroom. Oh and it's probably only likely to work once we night wean and/or stop breastfeeding. But Aaron does want her in there so the writing is on the wall as they say. This bunk bed doesn't just have the advantage of the bottom bunk being so low (you can only get a pair of slippers or the head of a Dyson to hoover under it) but it also has a low top bunk. To put it in perspective I can stand behind the head of the bed and literally lean in to kiss Aaron on the forehead. This means it is easy for me to make in the morning and given we are NOT in an old Victorian house with high ceilings, it means he has space between himself and the ceiling. Nothing worse than feeling claustrophobic on the bottom bunk. 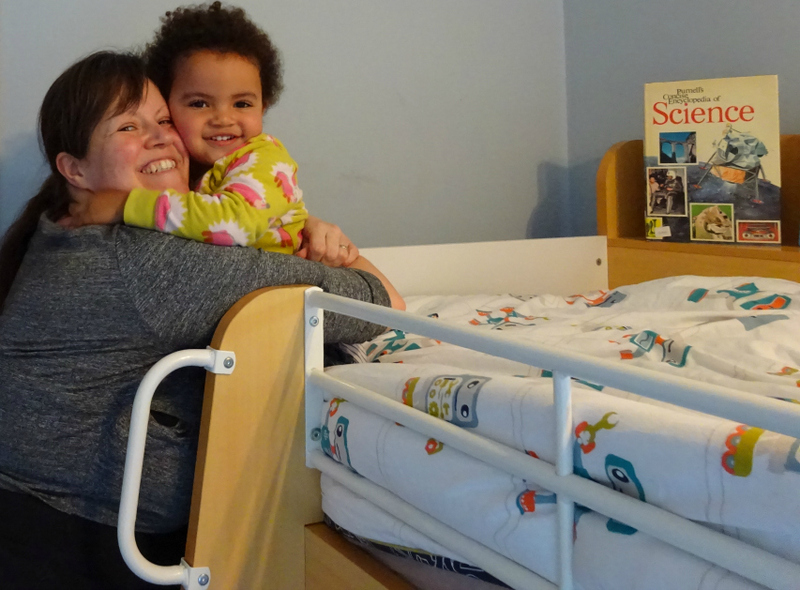 When I had pregnancy insomnia I often left our double bed and hopped into the bottom bunk so I know it doesn't feel stuffy down there either - the top bunk feels far enough away. All in all, after all the research I did this was my favourite bunk bed and still is. 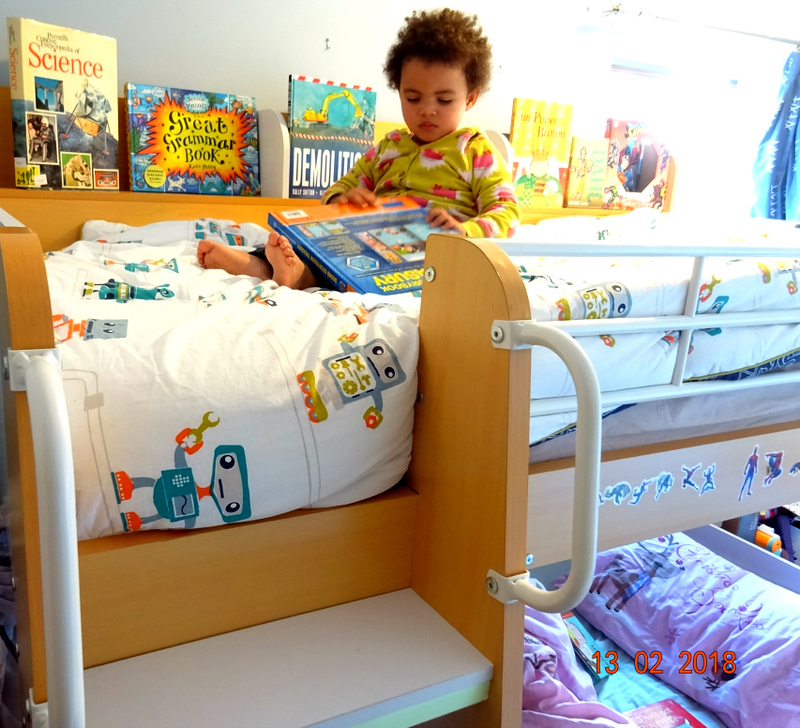 I have looked at Bed Kingdom again those as they have deals on and the Flick Bunk Bed looks good but I am no longer shopping for one so haven't read all the reviews as I did in 2015 with our lovely Domino - I never regretted buying it in Maple either. 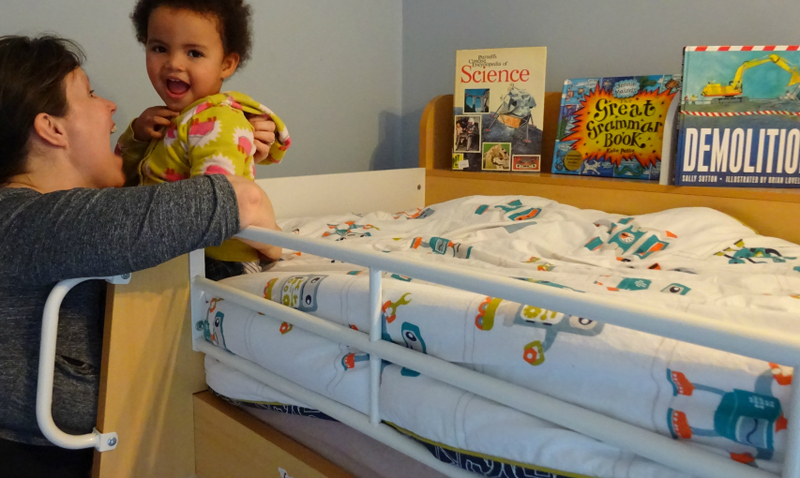 I was dreading her remembering that the bunk bed has a top bunk as I always worry she'll fall off it when I shouldn't really as she's been going up there under Daddy and Aaron's supervision for well over a year. I deliberately kept the bedroom door open which blocks the access to the ladder but the time came where she hopped out and over and up quick sharp. So apt that I pictured her next to the DEMOLITION book above as she literally threw down onto the floor about 50 books that were her brother's that she had no interest in. A pic of the mess that created would have been interesting. I set her up with the Paw Patrol book she has on her knee. 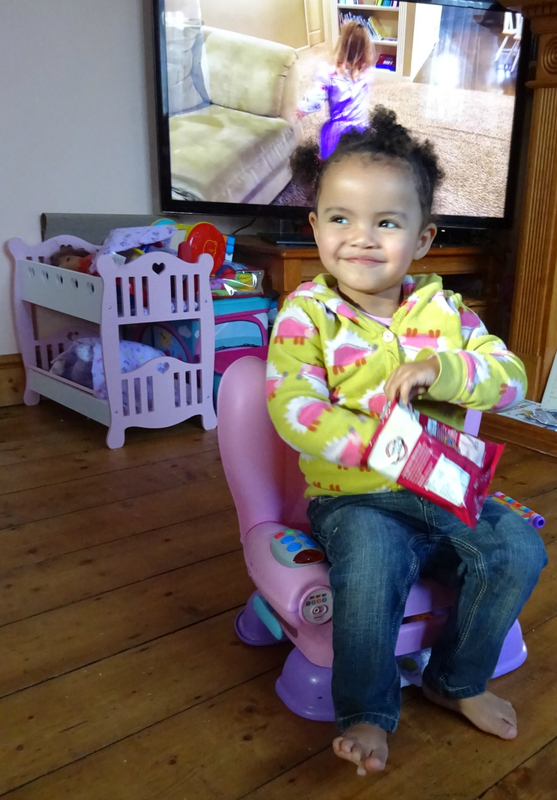 It has gazillions of buttons with sounds, so that kept her happy for a while. I was nostalgic when I came across The Prince's Bedtime up there as that used to be Aaron's favourite book and we read it every night a couple of years ago, starting from before he learned to read which amused me as he knew it off by heart. It took quite some time but eventually she was ready to come down. She can sit on the top step quite cosily as above but can't climb down like she does climb up, so she patiently waited for a Mummy lift. Before I grabbed her though she showered me in kisses as she LOVES spending time in Aaron's room when he's not at home and she loves even more spending time on the top bunk without being told off for being there and snatched away. As she was able to leisurely read and lie down up there she was thrilled. It was an eye opener for me, to see how very appreciative she is to do something she thinks isn't meant for her. Don't get me wrong she is always very joyful and loving but this was above and beyond that. A huge "thank you Mummy that was special". And with the afternoon sunlight streaming in, the quality time with my youngest was indeed lovely. Even when we went downstairs, Lottie's great mood continued and as you can see she looks like the cat that got the cream below. It's probably because in recent weeks Aaron has become SO territorial about his toys that being on the top bunk was probably like the shangri la for Lottie. But being that she threw about 50 tops off the bunk bed and is like a wrecking ball often breaking and ripping things - in a way Aaron never did at her age I might add - I can't really blame him being wary of her touching anything. Tonight he wouldn't even let her near his Smashers, his Zomlings and his Super Zings even though they are rubbery and very unlikely to get damaged in any way. Only other trouble with Lottie is she can throw things really far never to be found again, which is probably what Aaron's also aware of. What was I saying above about them sharing a room? Am I mad? I probably should order another bunk bed for the box room, decorate it all Lottie like and they can be as territorial as they like each in their own rooms LOL. We bought our Domino Bunk Bed in Maple from Bed Kingdom back in 2015. It's still going strong and I can't recommend it enough. I was given a wee small discount at the time as I mentioned I was a blogger. As you can see our endorsement of this product is genuine.